If you’ve spent a few nights staring the ceiling instead of sleeping, it’s possible that you experienced transient, or temporary, insomnia. Stressful events can often lead to less time spent sleeping. Your mind may have a hard time settling down. It’s estimated that nearly <40% of the adult population deals with transient or chronic insomnia. Transient insomnia affects more people than chronic insomnia, which can last for months. Insomnia can make your life miserable. Lack of sleep can make your mind feel slower and your body feel sluggish. You may be more irritable and prone to getting stressed out. Even though insomnia is common, it shouldn’t go untreated. If you have trouble functioning normally due to lack of sleep, it may be time to seek treatment. Alternative treatments may help address your insomnia. Yoga, meditation, and acupuncture have all demonstrated some ability to help alleviate insomnia. Studies have shown that acupuncture may help increase the quality of your sleep by allowing you to fall asleep faster and sleep longer. Part of this success may be due to acupuncture’s ability to reduce stress. In <a small study of eighteen anxious people, five weeks of acupuncture treatment helped participants sleep better. Those in the study had their brain waves measured to track when they fell asleep, when they woke up and how long they slept. The acupuncture treatment appeared to decrease the length of time that it took for them to fall asleep. In the same study, participants’ sleep duration was measured. Being able to stay asleep is also a measure of sleep quality. Those that received acupuncture were able to sleep longer than they had before the treatment. One reason that acupuncture may increase sleep quality is that the treatment appears to increase the amount of melatonin secreted. Melatonin is a hormone that makes you feel sleepy. Having more of it in your system may help you drift off faster and stay asleep. A final reason that participants may have slept better during acupuncture treatment is that the practice has been shown to decrease stress. Patients in the study reported less anxiety during treatment. Other studies have shown that acupuncture <decreases anxiety in rats using a meridian point that humans and rats share. The rats who received acupuncture were about as stressed as the control group, which didn’t interact with any stressors. This finding implies that acupuncture may negate stress symptoms. Being less stressed makes it easier to sleep. Hypnotic medicines may not be the best choice to help you sleep. Acupuncture has demonstrated improvement in sleep quality. You can pair the acupuncture treatments with other alternative therapies that have shown promise in treating insomnia, such as yoga and meditation. Investing in a healthy sleep environment may also help you rest. <Upgrading your mattress, adding blackout curtains, and using a white noise machine may help you sleep undisturbed by aches, lights or sounds. If you are struggling with insomnia, take some healthy steps, like signing up for an acupuncture treatment or a yoga class, to alleviate your sleeplessness. It is said that high blood pressure patients (HBP) have to take medication for rest of their lives; however, this patient’s HBP has been remedied by acupuncture. On 11/4/2011 Ms. H came to our clinic and started her treatment for neuropathy, fibromyalgia, and high blood pressure (HBP). Initial prognosis showed Bell’s posy; numbness and movement problem on left side of her body; pain in whole body especially in shoulder and lower back; bloating in abdomen. Blood pressure: 144 / 81 with blood pressure pill (She has been taking HBP pill for 28 years). Since her blood pressure lowered, she has cut her HBP pill gradually from a half dose, to 1/4 doses and eventually to 1/8 dose. She completely stopped her HBP pills as of 11/11/13. She continues to receive acupuncture treatments bi-weekly. Strangely, my patient was not the first person to tell me about his health problems. It was his sister from California who called and asked me to acupuncture him to alleviate his pain. My patient was bedridden; he does not like to move at all. I don’t blame him. He had a surgery 7 years ago–4 screws, his lower back. Two years later his back felt worse every day. To add insult to the injury, he fell and broke two screws. He could only sit up or stand up for less than 3 minutes before having to lie down. Although his doctor recommended 3 more surgeries to fix the screw, he said “No, I’ve had enough.” That’s how he ended up here. 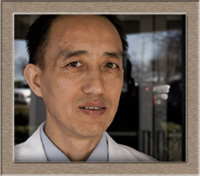 We began the treatment plan with twice a week acupuncture which gradually increased his comfort. To quicken the recovery process we decided to change our treatment plan to a once-a-week combination of acupuncture and Tui-Na (therapeutic Chinese massage). After one year, we could see progress; he can stand up for up to 10 minutes. He could even go to Wal-Mart with his sister! Since then, we’ve continued this treatment plan and he’s about to move around for up to 20 minutes. He has been my patient for the last three years, and he continues to maintain and improve his health. Acupuncture doesn’t work overnight especially not for major injuries. It may take years of treatment to see improvement. But it’s better than western medicine’s solution: to cut you open again and literally charge you a back for it. The first time we met was in May 2009 and he shared with me his symptoms listed above. My patient works in a company headquartered in Memphis; it also has a few branches in Europe, Asia and South America. His work takes him all around the world with many hours on the plane, grueling schedules and a lack of sleep. Because he spends so much time on the job, he has had little to no time to take care of himself. The lack of attention to his health caused him terrible problems. Despite his efforts to seek help from many different doctors, none were able to help him, and some even have great difficulty making a diagnosis, much less alleviating his pain. One day, his friend told him, “Acupuncture may help,” so he came to see me. After one treatment, his diarrhea got a little better, the bleeding lessened, his speech returned, and he generally feels better. Three treatments later, his diarrhea condition improved dramatically, the bleeding slowed, and his sinuses went back to normal with no more allergies or reflux. After six treatments, he completely stopped experiencing diarrhea and bleeding; there was also no sign of laryngitis. Let’s just say he was a very happy man. Now he continues to seek steady treatment to maintain his great, new health condition so he can finally live his life. Our patient works at a computer all day, every day, and she does try to keep from becoming too stiff by stretching out and moving around during breaks. Despite her genuine efforts, she still experiences aches in her shoulder, arm, hip, and seat bone; numbness in her little finger; tightness in her thighs and legs; as well as cramps in her calves at night. My observation is that many parts of her body, even the whole back has a stagnation of Qi (air or oxygen) and Blood which causes the lack of nutrients to the muscles. I treated her to regain the flow of Qi in her back. The Beijng Modern Acupuncture Blog. The main reason I started this blog is to keep my patients informed about my current work, because I believe that by sharing my knowledge and experiences, I will be able to bring many more people out of pain and misery (something that plagues us all as we grow older). More specifically, I’ll be sharing some successful case studies and a few unsuccessful ones as well. Acupuncture, like any other type of medicine, be it Western or Eastern, is a series of trial and error; please keep in mind that the same treatment on same symptoms may vary for different people. In addition, since I’m also an herbalist I’ll be sharing my experiences with what herbs/supplements work well for certain conditions. And finally, I’ll be making announcements regarding big changes or if I’m on vacation. © Copyright Beijing Modern Acupuncture Blog 2007. All rights reserved.